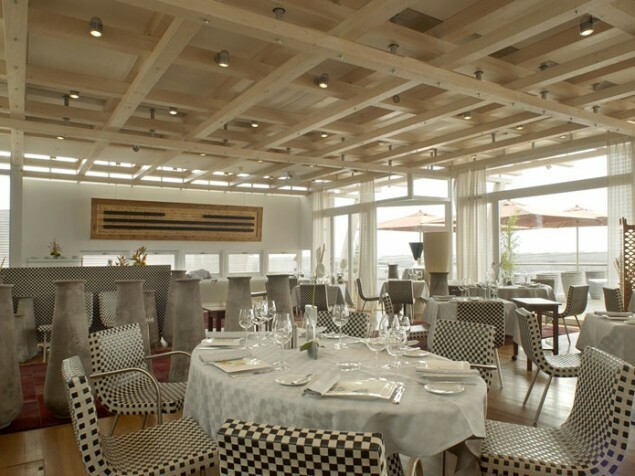 Neutral colors and naturally sustainable materials enhance the dining experience of "le Colvert"
Contemporary, sustainable design, high-tech amenities, and the tranquility of Lake Neuchatel, all come together in this one-of-a-kind luxury accommodation. 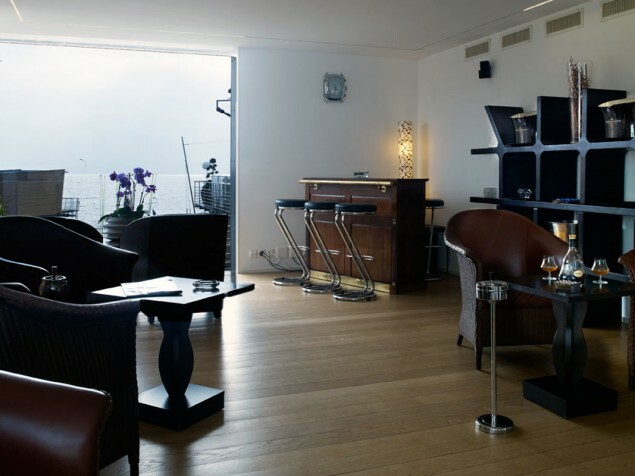 This little slice of heaven is Europe’s first luxury hotel built over a body of water. 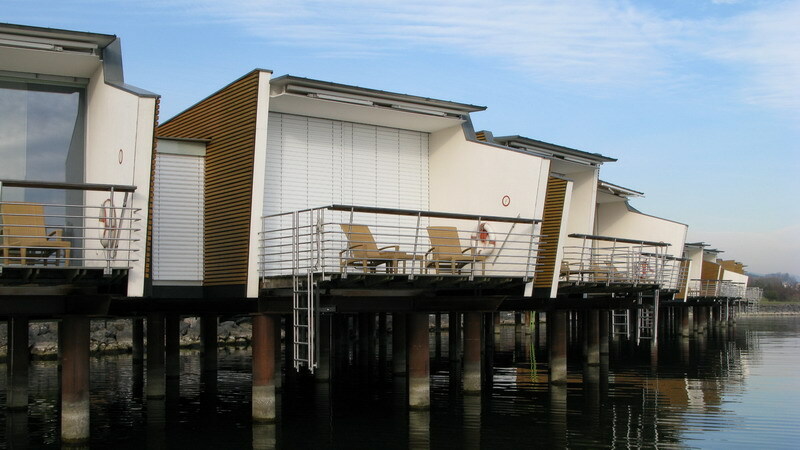 Elevated on piles on Switzerland’s gentle Lake Neuchatel, Hotel Palafitte offers 40 contemporary luxury “pavilions”. The pavilions are closely spaced freestanding units, constructed either directly on the lake (24 pavilions) or on the shore (16 pavilions). 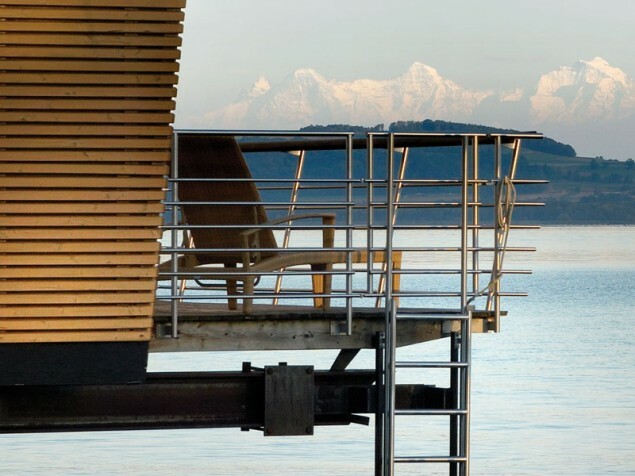 Each pavilion is a spacious one-story suite, offering views of Lake Neuchatel and the Alps beyond. A clever design feature is that each entrance is offset or angled from the approach. Combined with fencing to enclose each unit’s patio, privacy is provided for every guest. 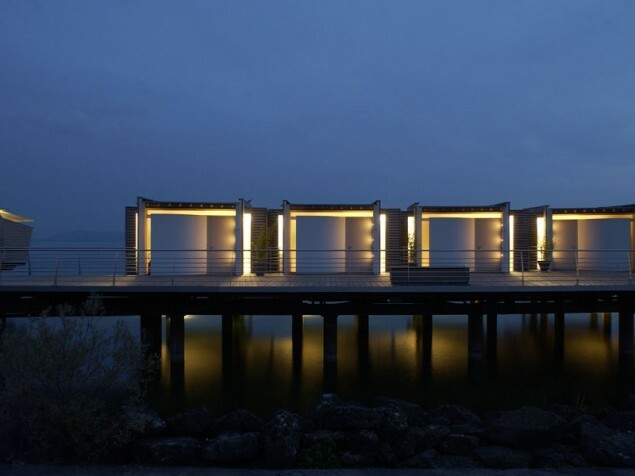 The exterior of the pavilions are plain, box-like structures, of natural wood materials, in harmony with its lakeside location. 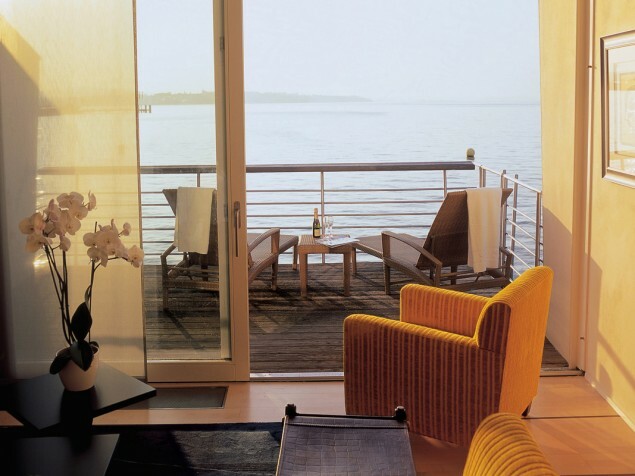 Architectural details are intentionally kept to a minimum as a thoughtful frame to the views of lake and Alps. The interiors are contemporary with a warm and welcoming style. Amenities within the pavilions include flat-screen TV, Wi-Fi, Jacuzzi, minibar and personal computer. Dining is available in the lakeside restaurant as as is 24-hour room service. 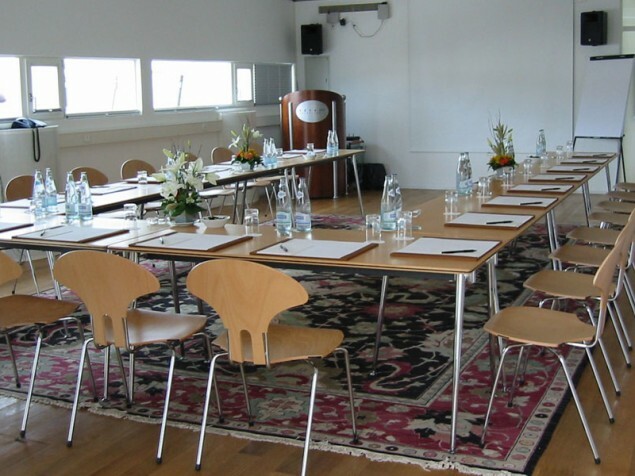 There are two meeting rooms available, each equipped for telecommunications and videoconferencing. Hotel Palafitte features state-of-the-art building management and environmental control systems. These monitor guest access and security, climate control, fire protection, and telecommunications. Guests are able to fully monitor environmental conditions and control entertainment within their pavilion. Access to the hotel is available via free public transportation from the town of Neuchatel. Additionally, the hotel encourages the use of electric vehicles and provides 5 charging stations for guests. It is refreshing to find a totally unique hotel experience such as Palafitte. It reflects the commitment and creativity of the entire hotel team, and has quite a lot to offer for its relatively small footprint.